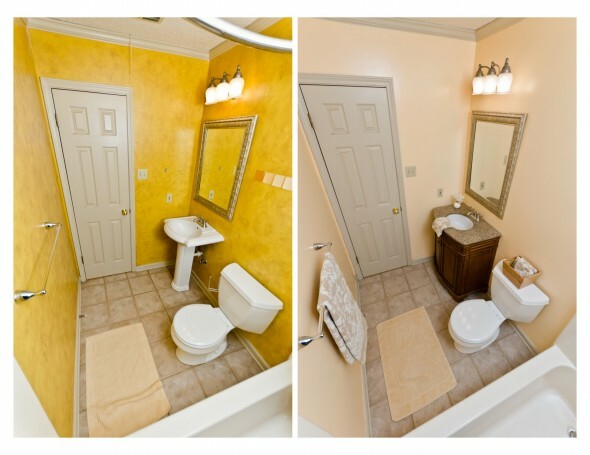 When we bought our house, we knew that our second bathroom was sort of terrible. The fixtures were nice, but the room was painted bright yellow with a sort of multi-layer brown/gold spongy finish. I suppose the previous owners had thought that the effect would be rich and elegant. I thought that the effect led one to believe that a large mammal had been smeared in its own poop and then had seizures in the room, blotting the excrement all over the walls. A second problem involved the sink. It was a nice Kohler pedestal, but its lack of a cabinet meant that there was no storage at all in the small bathroom. This was a problem for our teenager - even a low-maintenance girl like Mandy needs a place to store a few bathroom things. Since the room doubles as a guest bathroom, there was no way for her to store her own lotions and potions that still allowed the room to be presentable for guests. It was getting more and more frustrating for all of us. So this year, one of her holiday gifts will be a remodeled bathroom. On the Saturday Mandy left for her annual winter trip to Tulsa, Bryan and I shopped for and bought a new vanity, counter, and sink for the bathroom. Sunday was spent removing the fixtures, repainting the room, reinstalling the toilet and adding the new vanity. We all wanted a brighter orange wall color, but it would have clashed with the granite countertop. It's actually turned out rather more classy and grown-up than we'd intended, but it's very pretty and I suppose we'll manage.